Simon Wainwright, imitating the dog. Final preparations are underway as Hull’s buildings, streets, shop windows and winding alleyways become the pages on which stories are told. Starting on Thursday next week, Hull will be shown at its dazzling best as Absolutely Cultured presents Urban Legends: Northern Lights, a newly commissioned outdoor event that will illuminate the city over four nights with captivating projections and atmospheric soundscapes, igniting the imaginations of audiences of all ages. Taking inspiration from ancient mythology, fairy tales and oral history, Urban Legends: Northern Lights will draw on the connections between Hull and the countries across the North Sea in Northern Europe and Scandinavia, sparking conversations about the common stories shared between these places. From large and impressive to intimate and moving, the event brings together six leading national and international artists from the UK and Scandinavia, marking the return of many of Hull 2017’s celebrated artists. Returning artists include Zsolt Balogh’s New Visual Paradigm, the artist behind Made in Hull’s widely acclaimed We Are Hull; Studio McGuire who created Land of Green Ginger’s Micropolis; and Heinrich and Palmer and imitating the dog, who lit up The Deep with Floe and Arrivals and Departures respectively. Excitement has been building in all corners of the city, with residents creating their own magical boat, which will be brought to life as part of Lost Paradise, and a community chorus of 100 local people have been rehearsing ready to provide the beautiful soundtrack to Oh The Night!. Creative Director and CEO of Absolutely Cultured, Katy Fuller, said: “It’s wonderful to see the city buzzing with the anticipation of Urban Legends: Northern Lights. “We know what resonated with people last year – events that saw the city come alive, with people sharing a story played out on the city’s buildings and in public squares. As Absolutely Cultured, we want to deliver ambitious and imaginative events – Urban Legends: Northern Lights will be our biggest and most ambitious event yet. 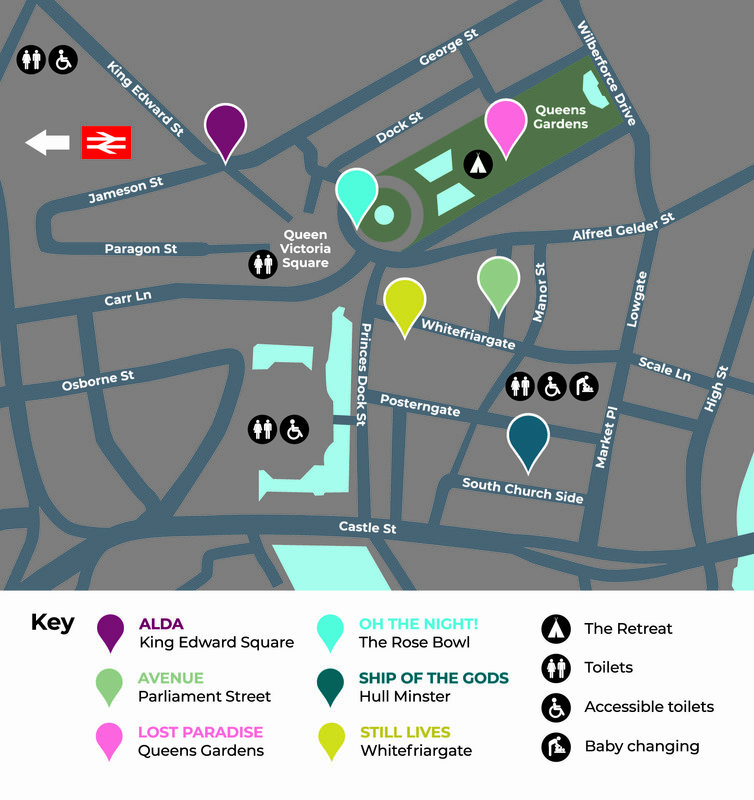 Using the city’s streets, shops, buildings and public spaces as the pages of its story, Urban Legends: Northern Lights will unfold at The Rose Bowl, in King Edward Square, Queens Gardens and Hull Minster, as well as streets and shop windows down Whitefriargate and Parliament Street. Maps are available from the Pod, Tourist Information and from the City of Culture Volunteers who will be distributing them around the city this week. It is also available to download here. The work of Absolutely Cultured would not happen without the generous support of funding partners, particularly Arts Council England and Hull City Council. Urban Legends: Northern Lights has been made possible with the support of our corporate partners including Wykeland, Rollits and BP.